Is it really only Day 4? Just remember you have until midnight, 30 November 2012 AEST to get your entries in for all the giveaways. Today I want to talk about Beautiful Books. Made by me. And maybe you. With the help of BLURB. I first signed up to Blurb, an online publishing system, a few years ago. I had some ideas for making some photo books but I didn't get very far. So when Blurb recently offered me a $50 voucher to review its online bookmaking site, I thought the time had come to finally try it out. And I'm genuinely glad I did. It was as easy as creating a login so I could save my work, uploading my photos, making a book with one of the bookmaking tools, ordering the book and sitting back and waiting for it to arrive (which took days only). You have to love the Internet! The hardest part was choosing the theme for my book. I actually have a list of photo books I want to make - Italy, Hong Kong, Thailand, Melbourne, my Father, family history, my Message from your Mother blog series and my favourite recipes, oh shame, they don't make books with 2 pages. 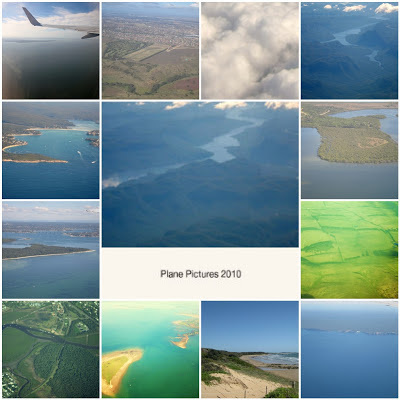 I chose to make a Plane Photos book. Yes plane photos not plain photos, although I have plenty of them too. Plane photos are pictures I took out of plane windows in 2010 (I know a little sad). I was really surprised with the finished product - it really is bookstore quality. 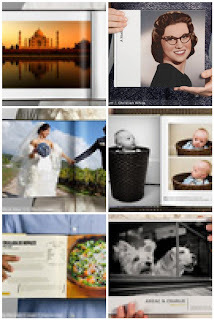 The cover of the book is the middle picture and the other images are included in the book. With Blurb you can make a whole range of books, anything you want. You can also create PDF versions and convert it to an e-book. So this is a special call out to all bloggers, this is a great giveaway for you in particular as I know that you could make a great book about your blog. I have a $50 voucher courtesy of Blurb up for grabs so leave a comment in the comments section if you want to enter. That could be someone's Christmas gift sorted or a chance for you to try Blurb and make a special book. Also, up until 10 December, Blurb is also offering Lilly's Life readers a 25% discount on its products before Christmas - these books make great Christmas presents. I would tell you what I personally have planned, except my family may be reading this.....and they unfortunately still believe in Santa Claus...... (The 25% off code is LILLYS and it expires on 12/10/12 - up to $150). Psssttt.....if you 'like' Lilly's Life Blog's Facebook page (if you do Facebook that is) you get a second entry into the giveaway as well. Just let me know in the commments. I absolutely need this :-) I have about 50 poems written about a dog called Bozo (based on his photos), belonging to a blog friend (Bozo has his own blog as well). I am looking for someway to make it into a book and present it to someone . Thank you! You have I know. You could fill 200 books Ugich with your writing, poetry and images from India. Do you want the 25% code as well. What a great idea these books are. I would like to win it for my friend who is planning her mother's 80th birthday and wants to do a photo book. I am not on Facebook so can't like you, if you get what I mean. I've been wanting to do this forever! I'd make one of my daughter! Off to like your FB page! Happy Weekend! I might make a book of my favourite art pieces! Your plane photos look beautiful...lovely blues and greens. This is so cheesy, but I really want to do it. I'd make a book about my relationship with my awesome boyfriend! I would make a book of select Helen poems from my blog ... with images to compliment them. And even if I don't win your voucher, I'm intrigued with the whole concept. I've used Blurb twice and can vouch a well for a great quality product! Once was for the "early years" of the blog posts, which is a coffee table item. The other was a birthday gift for my Mom, had pictures (from when she was a little girl to now) and poems (that my Dad wrote for her). She absolutely loved it. Last year I made a book of my daily photos for the year and this year I want to do the same. Last year's book was with Blurb's competitor so it would be interesting to see how they compare. I would like to make a book about my trip to the Canary islands. What a great idea they are. Am a Facebook liker. I would like to make a book about my beautiful baby daughter Madeline. I did not realise that you could do these books that easy. My email address is madeline.browne321@gmail.com - I would also be interested in getting the code for the 25% just in case I do not win. I would love to make a book about my family tree and these look good. Thankyou. I would like to make a book about my cat, Smokey. It would be fun. Thanks for the opportunity. Dear Lilly of the giveaway I would be so grateful to win a $50 voucher. If I was being too inquisitive and someone asked if I was "writing a book", then I could answer yes. Is the world ready for Lisleman's Loopy Logical Advice? I would like to put my blog into a book, I would just love to publish all those words. I might make a book about interior designs, something that I am passionate about. Also a fan of your fb! Oh WOW! This is a wonderful idea! My son is always writing stories and has been insisting that he'd like to create a 'real book' to put them all in. He particularly likes writing War Stories and has hundreds of photos of army tanks and war things from a visit to a European war museum earlier this year. This would be an amazing thing for him to take in and show to the class - although I'm sure once he created one book he wouldn't be able to stop! I would LOVE to make a book of all my favourite things - photo memories, favourite recipes, poems and drawings I have kept from my childhood and old diary entries. Bound together in a beautiful book is one way I can secure and store them for my grandchildren to read! I would love this to make a book out of a story I wortoe my daughter. This would be a great prize. I would love to make my wedding book. Thanks for the giveaway, I like you on FB!! I'd make myself a cookbook, I have lots of photos from when I used to have a food blog. Then I could add the recipe text, and voila! No more searching through my random scraps of paper/scribbled notes to myself to find my recipes. I would make a book about the things our family has done over the past year. One for each child. I would make a "Grateful" book about all the things I am truly grateful to have in my life. I'd make a book with all the pictures of my family and friends I haven't had time to print out! I am putting together my first Blurb book now, for my little girl's special moments to now.i REALLY should do one for our wedding from 10 years ago, or our amazing overseas holiday in 2004... A voucher would really help! Already a liker on FB! What a fantastic idea. I would compile photographs from my last holiday visiting relatives in my motherland and send it back to my dear Grandma. I really want to make a book of photos of my 5 year old son through the years (even though I do have a blog - I'm not sure which section of my blog I could use this for :o/). Id make a family album book of my baby boys family, all his cousins, aunties, etc with their names in it for him to learn, theres so many!